SAN FRANCISCO— The Center for Biological Diversity today filed suit to strike down the Obama administration’s corporate average fuel economy (CAFE) standards for cars, trucks, and SUVs for model year 2011. The Energy Policy and Conservation Act requires miles-per-gallon standards be set at the “maximum feasible level,” yet the Obama rule sets a significantly lower standard than proposed by the Bush administration in 2008, and is much lower than current standards in Europe, Japan, China, and other countries. The lawsuit was filed against the National Highway Traffic Safety Administration and Department of Transportation in the Ninth Circuit Court of Appeals in San Francisco. The Obama rule, issued last Friday, requires that passenger cars achieve only 30.2 mpg and that SUVs and pick-up trucks achieve only 24.1 mpg in 2011. Both these numbers are lower than Bush’s proposal of 31.2 mpg for passenger cars and 25 mpg for SUVs and light trucks. It will result in millions of tons of greenhouse gas emissions more than the Bush proposal. The current European and Japanese standards are about 43.3 and 42.6 mpg, respectively. China’s current standard is 35.8. The transportation sector accounts for about a third of U.S. greenhouse gas emissions, and any rational plan to address the climate crisis must achieve dramatic fuel economy improvements. Despite the existing legal mandate from the Energy Policy and Conservation Act that the standards be set at the “maximum feasible level,” the U.S. standards lag far below current standards in Europe, Japan, China, and other countries. The new standards come in response to a federal appeals court decision won by the Center and others in 2007 striking down the Bush standards issued in 2006. The court ruled that the standards failed to adequately consider the vehicles’ greenhouse gas emissions. As the Bush administration was formulating new standards, Congress passed the Energy Independence and Security Act in December 2007, which mandates that the agency require the combined car and truck fleet reach a minimum of 35 mpg by 2020. In May 2008, the Bush administration issued a new proposal. While those standards were well below what are technically feasible and required by law, they were higher than the final decision issued by the Obama administration last week. The standards finalized by the Obama administration for passenger cars are a full 1 mpg lower than the Bush proposal. The standards for the light truck category, which includes both SUVs and pick-up trucks, are 0.9 mpg lower than the Bush proposal and only .1 mpg higher than the 2006 standard, which was overturned by the Ninth Circuit Court of Appeals as inadequate. The Bush administration postponed finalizing the standards as Congress and the administration developed options for a bailout of U.S. automakers. President Obama issued a memorandum in January directing the Department of Transportation to revise the rule to incorporate relevant technological and scientific considerations. Today’s regulations affect only model year 2011; later model years will be the subject of a future rulemaking. Figure 1: Fuel Economy by Country/Region. 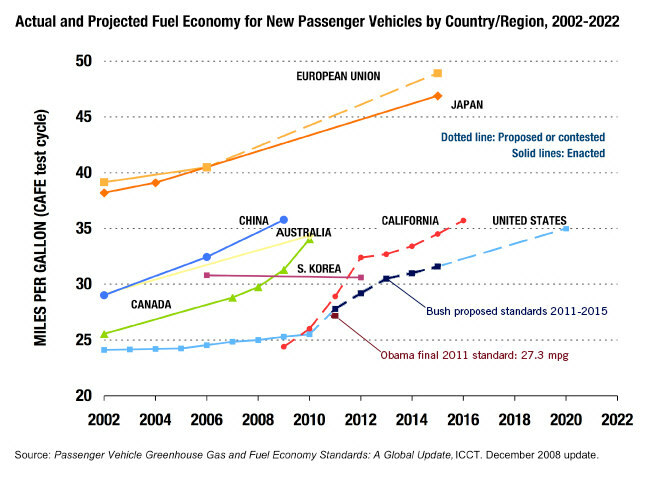 Source: Passenger Vehicle Greenhouse Gas and Fuel Economy Standards: A Global Update, ICCT (December, 2008); Bush proposal for 2011-2015 and the final Obama standard of 27.3 mpg has been added to the ICCT graphic. Ninth Circuit Court of Appeals Decision in Center for Biological Diversity v. National Highway Traffic Safety Administration, overturning the 2006 Bush standards. The Center for Biological Diversity is a national nonprofit conservation organization with more than 200,000 members and online activists dedicated to the protection of endangered species and wild places.